Snowshoeing is a great way to enjoy a winter walking workout. Unlike cross country skiing or downhill skiing, you don't need lessons. The basic snowshoe walking technique on level ground is simply walking, although you will have a wider stance. Modern snowshoes are narrower, shorter, and lighter than the long wooden snowshoes of yore. The bindings pivot to allow you a more natural walking gait. They spread out your weight so you don't punch down into the snow with each step (post-holing). Snowshoes are widely available for under $100, with some models under $50, which is far less than ski equipment. Poles are optional when snowshoeing on level ground, but you will find them useful if you will be going uphill or downhill. Ski poles work well. Many trekking poles come with snow baskets, the flange you can add at the end of the pole so it doesn't sink into the snow, so you can use them for snowshoeing. You can wear snowshoes with hiking boots, trail running shoes or snow boots. Waterproof or leather footwear is best for staying dry and warm. Gaiters help keep snow out of your shoes and keep your pants dry. A ski helmet isn't required as you won't be shushing down slopes at high speed. But if you are going into an area where there may be falling rocks or ice, a helmet is a good idea. You can rent snowshoes at ski shops, and this can be a good option if you are going on your first snowshoe outing. The snowshoes go on easily with straps, but It's best to find a dry place to sit to gear up. Once the snowshoes are on, it is easy to move about simply by walking. The only tricky part is not tripping yourself by stepping on one snowshoe with the other. You will need to keep your stance wider and be aware of this as you begin. You will be giving your hip flexors more of a workout due to this stance, so expect some muscle aches the next day. Snowshoes grip the snow with built-in crampon spikes at the toe and heel. The spikes allow you to simply walk along without slipping and without using any fancy technique. It is important to plant the snowshoe flat on the surface to get a grip with the crampons. Going uphill, you can kick into the snow with the toe of your boot to create a step and get a grip with the crampons that are under the ball of your foot. If the slop is hard packed or icy, the claws of the snowshoes will grip and you will need to use your poles for extra support. Many snowshoes have a heel lift that you can flip up to give you more stability. Going downhill, plant your poles in front of you to provide balance. Keep your knees slightly flexed and plant your heel first, followed by your toe. If your snowshoes have heel crampons, you can lean back slightly to place your weight farther back. If they don't, keep your weight over your feet so your toe crampons will keep you stable. If you find yourself slipping, simply sit down to halt the slide. 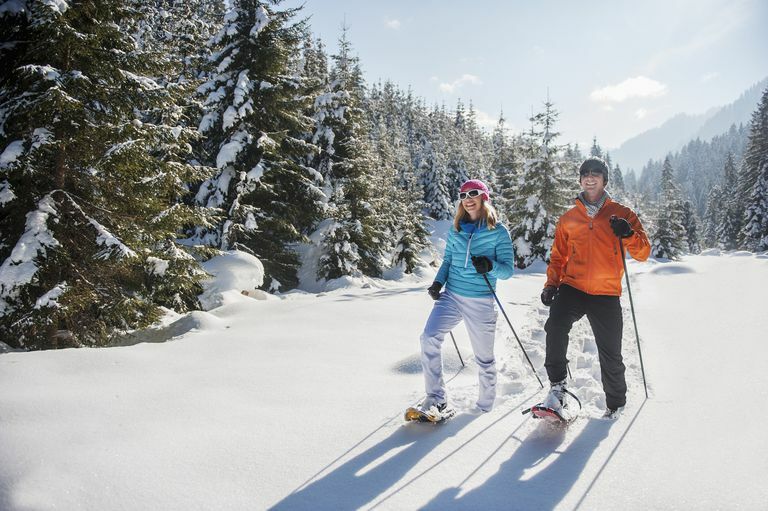 Snowshoeing can burn over 1,000 calories per hour. You will feel a good exertion and heat up quickly. At that rate of calorie burn, you will sweat no matter what the temperature. Your snowshoeing speed can be surprisingly similar to plain hiking. For example, you can cover 2.5 miles in about 50 minutes. A round trip of 5 miles with a lunch stop may take only three hours. The muscles used for snowshoeing are similar to those used in walking and in hiking in hilly terrain. Your hip flexors may feel more of a workout, and your quads may get more exercise than usual in walking due to the lifting motion with each step. Layering is important to wick away sweat, keep you insulated and protect you from snow and wind. Your inner layer should be of a wicking fabric. The middle layer should be an insulating layer of wool or fleece. The outer layer should be windproof and either water-resistant or waterproof depending on the climate. A hat and gloves will help keep you warm. Sunglasses or ski goggles will protect your head and eyes from sun and snow glare. Don't forget the sunscreen—the snow will reflect the rays and burn you faster. Carry a pack with water, a snack, and other hiking essentials. A mobile phone is strongly suggested when hiking on winter trails, although you may be in an area without cell coverage and the battery may not last as long in the cold. Snowshoeing a great way to enjoy winter trails without the need for lessons. Use it for a great winter walking workout.